Set within the heart of the Napa Valley’s viticultural and culinary mecca, Yountville, the Villagio Inn And Spa boasts a magnificent location on the 23-acre Vintage Estate. Inspired by the wineries of Tuscany, this luxury property is lavishly landscaped with Mediterranean-style gardens that are dissected by pathways of flowing water, creating a sublime atmosphere of tranquility. 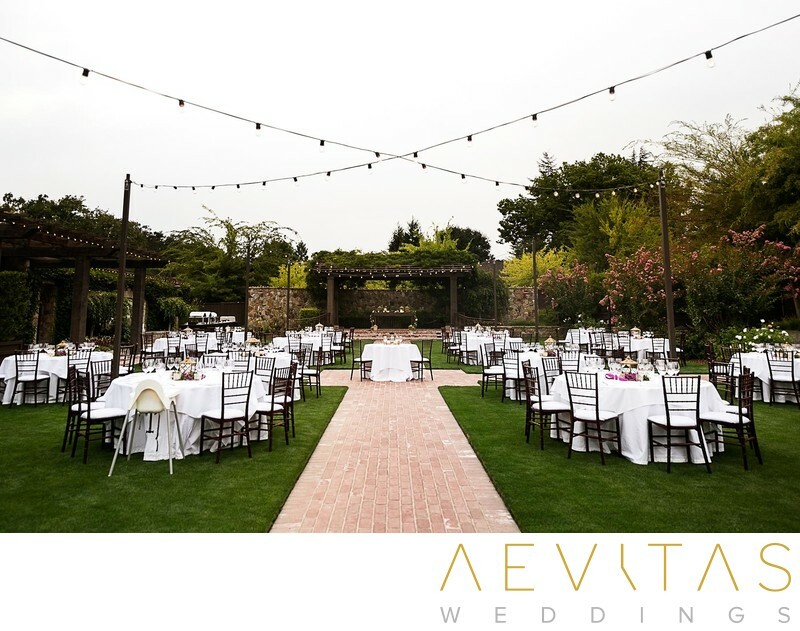 As a family-owned property, the Villagio Inn And Spa strives to create personalized and unique wedding experiences, imbued with the elegance of traditional wine country hospitality. You can select from a number of different wedding venues within the Vintage Estate property, each with their own special features. For large wedding parties, the expansive, outdoor grand Pavilion is designed in a classic Californian-style, with natural stone walls and lush greenery creating an exclusive space. Its surrounding gardens are planted with oleander, lavender, and roses, together with evergreen and flowering magnolia trees that give the space an undeniable elegance. Combining two separate spaces - the East Garden and West Garden - the Pavilion can accommodate up to 1,000 guests for wedding ceremonies and receptions. While some couples opt to hold their reception within the lush Pavilion gardens, others move inside to the Villagio Inn And Spa’s richly adorned Historic Barrel Room. Dating to the 1870s, it once served as the wine maturation cellar for the Groezinger Winery, but has since been beautifully restored with wrought iron chandeliers, high beam wooden ceilings, and state-of-the-art lighting systems to create an exceptional wedding venue that exudes the romantic charms of yesteryear. For smaller wedding parties, the Groezinger Estate House, situated between the Pavilion and the French country-style Vintage Inn, creates a more intimate space, featuring both outdoor and indoor areas. Wood-burning fireplaces, a rich wooden antique bar, and a private patio create a warm ambiance for your guests within this stately 19th century mansion. No matter the size or scale of your wedding party, the Villagio Inn And Spa will provide gourmet catering options, beautifully paired with local wines. To complement their outstanding wedding venues, the Villagio Inn And Spa boasts warm and luxuriously decorated guest rooms and suites, together with an onsite wellness retreat, the Spa Villagio. This treatment center is complete with private spa suites, indoor and outdoor sunken infinity tubs, steam showers and cosy fireplaces that create an undeniable atmosphere of romance. Within an enviable location within the Napa Valley’s fabled wine growing region and with plenty of boutique tasting houses and superb restaurants within a short walk, the Villagio Inn And Spa is the ideal setting to expand your wedding ceremony and reception into a long weekend of gastronomy and celebration, shared with your closest friends and family.